We are here because the new health law forbids insurance companies from discriminating against licensed healthcare providers. For us this means those licensed and trained practitioners of acupuncture, chiropractic, naturopathic medicine, professional midwifery and massage therapy. Insurers almost always deny claims for these services. Although that has slowly started to change, where practitioners are licensed denial is still discriminatory. Section 2706 of the Affordable Care Act was created to end this practice for patients when they are treated by a licensed healthcare practitioner. 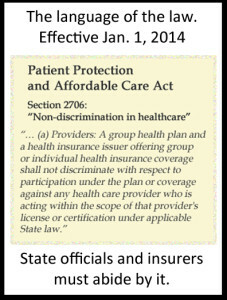 Section 2706 offers a potentially great advancement for patients who want the widest access to care providers. It can mean lower treatment costs and more care options for you, your family and loved ones. And if you are an employer are worried about the cost of employee care, integrative care offers compelling total low cost advantages. But insurance companies are dragging their feet. And the state officials who regulate them don’t really get the new law. Plus, they don’t appreciate how many of their own residents benefit from these powerful, safe and effective therapies. “The Professions” for background on the disciplines, their extensive education, certification processes and where to find more about them. “Integrative Healthcare in the US,” for brief examples of how these therapies are becoming part of standard treatments – as complements or even alternatives. You can also find more on our About Page. And be sure to stay connected with us on Facebook.